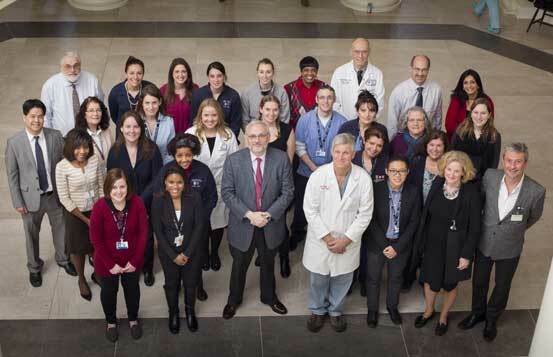 The International Mesothelioma Program (IMP) at Brigham and Women’s Hospital in Boston was founded in 2002 in response to the rising incidence of mesothelioma around the world. Since then, it has become the premier center for mesothelioma care and the largest of its kind in the world. More than 80 caregivers, scientists, and supportive staff work together to fulfill the IMP’s three-part mission. Our clinical team “goes for broke” to develop and employ the most effective, cutting-edge treatment strategies to offer quality life extension for patients. Our scientists bring together basic, translational, and clinical research to understand how and why mesothelioma develops and translate their findings into improved patient care. Our supportive staff includes social workers, chaplains, and patient coordinators whose work helps improve the quality of life for our patients and their families and friends.